SAYLORSBURG, Pennsylvania — A U.S.-based cleric has denied any role in or knowledge of the failed coup which Turkey has blamed on his followers. The government of Turkish President Recep Tayyip Erdogan alleged the conspirators were loyal to Fethullah Gulen. Gulen, who lives in Saylorsburg, Pennsylvania, espouses a philosophy that blends a mystical form of Islam with democracy. He is a former ally of Erdogan turned bitter foe. The Turkish president has often accused Gulen of trying to overthrow the government and he has been put on trial in absentia. Turkey has labeled his movement a terrorist organization but Gulen strongly denies those charges. Related: Why Didn't Rebel F-16s Shoot Down Turkey Leader's Jet? At two weekend news conferences, Gulen strongly denied having anything to do with the coup. 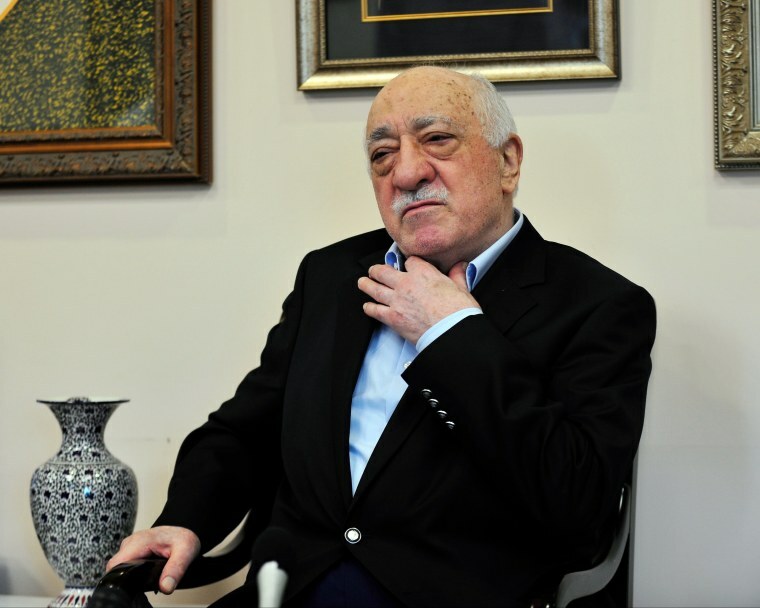 Gulen even raised the possibility the coup attempt had been staged, saying it had "all the signs of a movie scenario," in order to purge the military of Erdogan's opponents. In recent years, the government has moved to remove Gulen followers from the police and judiciary. The military, founded on secularist ideals, has been a staunch opponent of Gulen. Gulen told reporters he did not fear extradition and would obey any U.S. ruling. "This doesn't worry me at all. But I'm not going to do anything that will harm my dignity or that will go against my dignity," he said. At a funeral in Istanbul, Erdogan vowed to "clean all state institutions of the virus" of Gulen's supporters. Secretary of State John Kerry said the United States would entertain an extradition request for Gulen, but Turkey would have to present "legitimate evidence that withstands scrutiny." So far, officials have not offered evidence he was involved. Meanwhile, a European Union official suggested Monday that the swift rounding up of judges and others after the failed coup indicated the government had prepared a list beforehand. Turkish authorities on Sunday rounded up nearly 3,000 suspected military plotters, ranging from top commanders to foot soldiers, as well as 3,000 more judges and prosecutors. "It looks at least as if something has been prepared. The lists are available, which indicates it was prepared and to be used at a certain stage," said Johannes Hahn, the EU commissioner dealing with Turkey's membership bid. "I'm very concerned. It is exactly what we feared."